A fake veterinary surgeon who treated and operated on animals at a surgery in Somerset, has been jailed for fraud. Patrick Keniry was employed at a practice in Taunton for two years under the name Mike Evans - a qualified and legitimately registered surgeon. 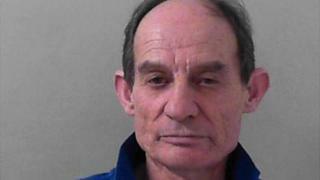 Keniry, 59, who has no veterinary qualifications, has four previous convictions for posing as a vet dating from 1985, Taunton Crown Court heard. He was sentenced to three years in jail for fraud by false representation. The court heard Keniry had previously been convicted of similar offences in 2011 - when he spent three years at a veterinary practice in Swindon. Sentencing, Judge David Ticehurst said the 59-year-old was a "fantasist" who was not a qualified vet but "would probably carry on committing offences like this for as long as he thought he could get away with it." Eleanor Ferguson, from the Royal College of Veterinary Surgeons (RCVS), said Keniry was a "pretty sophisticated fraudster" who was "in a league of his own". "I think it's fair to say he's made something of a career of impersonating veterinary surgeons," she said. "He takes the identity of a legitimate veterinary surgeon and creates a persona around that and creates the documents himself. So it's a very sophisticated scam he manages to pull off." She said in the 10 years she had been at the college she had "never come across anything like it". "From the details - we're aware of - there's maybe one animal who had some difficulties but that's one animal too many," she said. "We have checks and we always encourage practices to be vigilant and to check with the RCVS if anyone's in doubt."